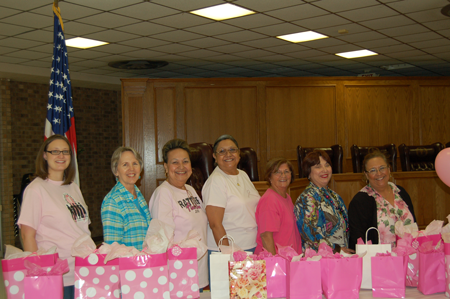 A special event addressing the “importance of” cancer screenings was held on March 10 at the Multi-Purpose Center in Rio Grande City. The program was sponsored by Texas AgriLife Extension under direction of Yolanda Morado a Family & Consumer Science agent. Co-sponsors of the event was the Florence J. Scott Study club who assisted in conducting the small group discussion and planning the event. There were four dynamic speakers who covered some valuable points during the event. Speakers encouraged women to have regular mammograms and Pap tests because the earlier these cancers are detected the more curable they are. Speakers included cancer survivors: Cassandra Salinas, Olga Gonzalez, and Laura V. Lopez. The health professional who addressed the group was Dr. Enrique Griego. He covered critical points and provided answers for the participants. He placed major emphasis on the importance of screens to detect cancer when it is at its most treatable stages. The group was treated to a reception and countless door prizes. The event also included several exhibitors who provided information on how to access screening services. They included: Planned Parenthood, Starr County Memorial Hospital, American Cancer Society, Rainbow Lines –Transportation, Su Clinica la del Valle, Better Living for Texans program. Picture Cutline: L to R Kelsey Hill, Tissa Peterson, Olga Gonzalez, Yolanda Garza, Abby Vela, Thelma Molina and Yolanda Morado. Committee members working to raise the awareness of the importance of screening for Cancer as part of the Friend to Friend – Staying Healthy Together program.